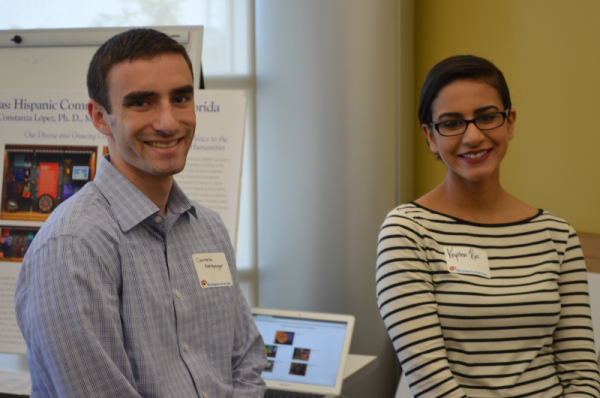 The Digital Humanities Initiative (DHI, http://unfdhi.org) was formed in the fall of 2015 as informal association of faculty, staff and students from across campus dedicated to promoting collaboration on interdisciplinary projects that combine the use of technology with materials and methodologies from the Humanities, Fine Arts and Social Sciences. Since that time, the DHI has coordinated events exploring the theory and practice of Digital Humanities scholarship, and provided a forum for faculty to work together on the design and implementation of digital projects. The DHI has helped faculty to engage students directly in hands–on Digital Humanities research, within and beyond the classroom, and has promoted opportunities for members of the UNF community to collaborate on digital projects with cultural institutions in Northeast Florida. Since its formation, an interim chair has led the DHI, with input from an advisory committee comprised of faculty from Brooks College of Health; the Coggin College of Business; the College of Arts and Sciences; the College of Computing, Engineering and Construction; and the College of Education and Human Services. Faculty and staff from the Center for Instruction and Research Technology (CIRT), the Office of Faculty Enhancement (OFE), Information Technology Services (ITS), the Office of Research and Sponsored Programs (ORSP), and the Thomas G. Carpenter Library have also played a critical role in the Initiative. Several undergraduate and graduate students currently serve on the Advisory Committee, representing the following departments and programs: Art and Design; English; History; International Studies; Languages, Literatures and Cultures; Political Science and Public Administration; Philosophy and Religious Studies; and Sociology, Anthropology and Social Work. The DHI currently supports a portfolio of digital projects led by faculty and staff based in the School of Computing (College of Computing, Engineering and Construction); the Department of Exceptional, Deaf and Interpreter Education (College of Education and Human Services); the Department of Economics and Geography (Coggin College of Business); and the following departments within the College of Arts and Sciences: Art and Design; Chemistry; Communication; English; History; Languages, Literatures and Cultures; Political Science and Public Administration; and Sociology, Anthropology and Social Work. We also currently support one project led by a current undergraduate student from English and a recently graduated student from History, conducted in collaboration with faculty mentors from those departments. Kathlina Brady, Aislinn Kelly, Clayton McCarl, Julia Rivera–Whalen and David Wilson. “Building an Interdisciplinary DH Community at the University of North Florida,” HASTAC 2017: The Possible Worlds of Digital Humanities; Humanities, Arts, Science, and Technology Alliance and Collaboratory; November 3, 2017, Orlando, Florida. Clayton McCarl. “Digital Humanities, International Studies and the School of Computing: A Call for Cross-College Collaboration.” School of Computing Colloquium, April 14, 2017, University of North Florida. Adelsperger, Cameron, Chad Germany, Paula Hernández, Aislinn Kelly, Jen Lee and Clayton McCarl. “Presenting the Digital Humanities Initiative.” Board of Trustees Meeting, June 7, 2016, University of North Florida. Buddy Delegal, Kalthoum Elfasi, Laura Heffernan, Aislinn Kelly, Jen Lee, Clayton McCarl, Anne Pfister, and Krysten Ross. “Student Involvement in Digital Humanities Research at UNF.” THATCamp Gainesville, April 21, 2016, University of North Florida. Ching-Hua Chuan, Sherif A. Elfayoumy, Aisha Johnson-Jones, Clayton McCarl, and Anne Pfister. “Introducing the UNF Digital Humanities Initiative.” Academic Technology Innovation Symposium, UNF Center for Instruction & Research Technology, Nov. 6, 2015, University of North Florida.